Had dinner there last night, it was a Saturday evening and we arrived shortly after the place opened. We were seated immediately, they only take reservations for parties of six or more. I had read some reviews about the place and many of them mention the excess noise level. That's definitely not a problem if you arrive early. The menu has a wide variety if ingredients and flavors. They also have a nice variety of cocktails listed in order of heaviness. 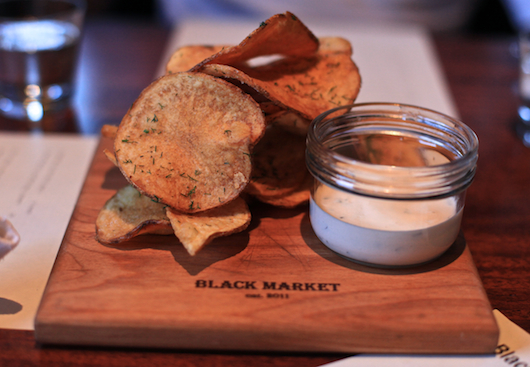 We started with a few cocktails and the Dill Chips, served with Malt Vinegar Aioli. 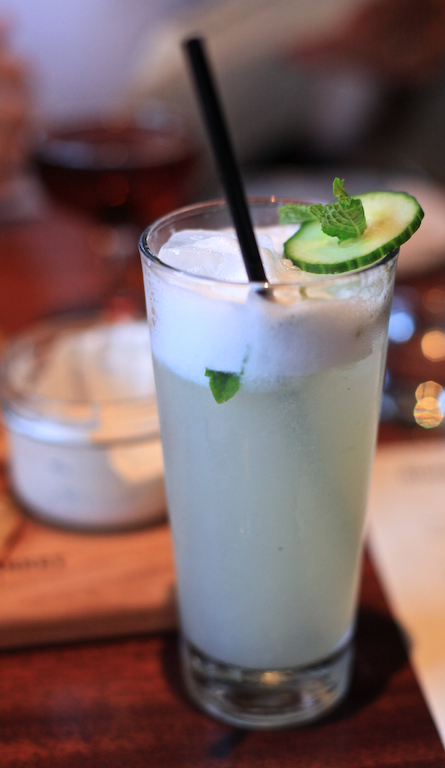 My cocktail was the City Fizz (gin, absinthe, lime, cucumber, mint, egg white), it was a nice a refreshing drink and not overly sweet. We also had the Red Hot and Bothered (Jalapeño-infused vodka, strawberry, blood orange, agave, ginger beer), which ridiculously good. The chips were very good, not greasy and the dip was great. We decided to order our food in waves, three dishes at a time. 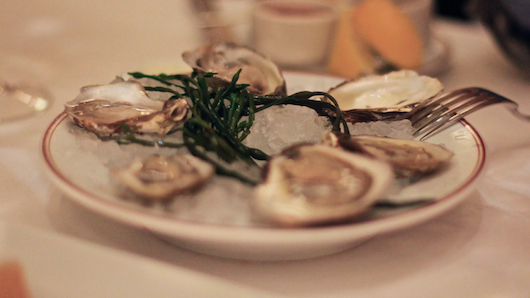 Our first round included Mussels, Deviled Quail Eggs and Soft Shell Crab Po boy. 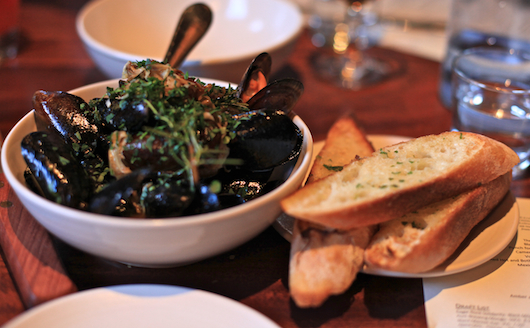 The mussels were delicious, the broth was buttery and aromatic. I liked the fact that they served the dish with three slices of bread, one for each person at the table. 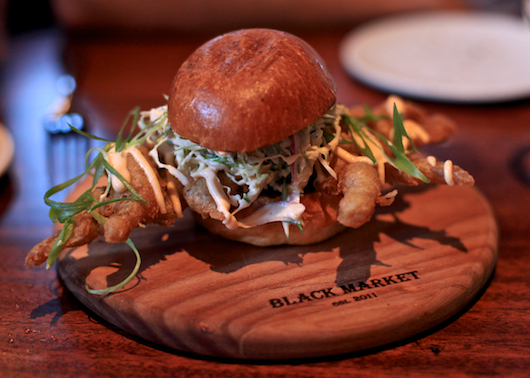 The Soft Shell Crab Po Boy was served on a Brioche Bun the size of a slider. The crab protruded from all sides of the bun. It was fresh and perfectly fried. The cabbage and Sriracha sauce were nice complements. 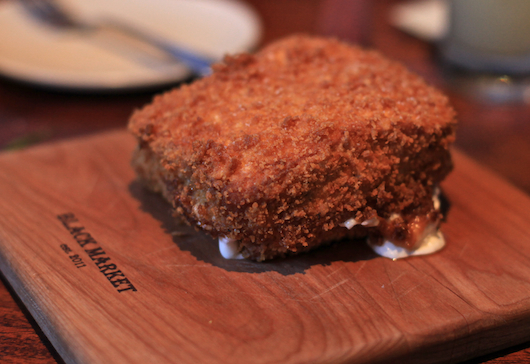 This dish reminded me a lot of the Fried Chicken Sandwich at Son of a Gun. 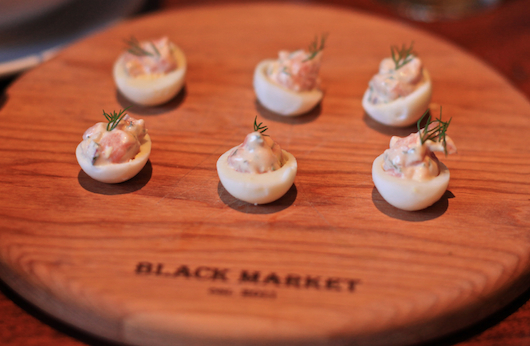 The Deviled Quail Eggs were good, but nothing special. There was a strong taste of dill which was not mentioned on the menu. The flavor of the tuna was masked by the dill and egg. 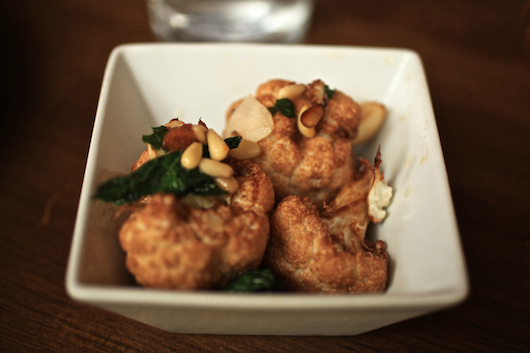 For round two, we ordered the Burrata panzanella with onion, olive, roasted pepper and mint pisto, Crispy Collard Greens with Benton Ham, Cheesy Grits and Soft Egg, last but not least the Fried Cauliflower with Lemon Aioli. 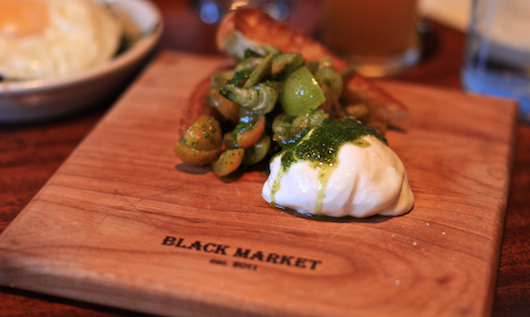 The Burrata was delicious, the sliced olives added a nice salty touch. 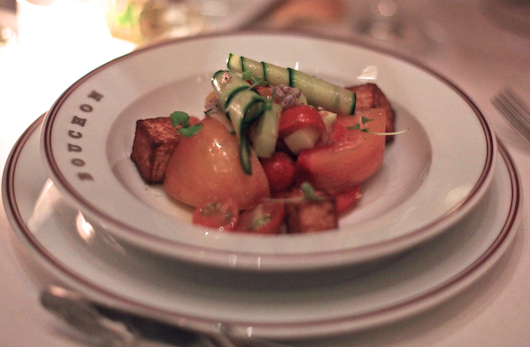 This is a interpretation of a panzanella salad, the bread is more like croutons and the items are not tossed together. 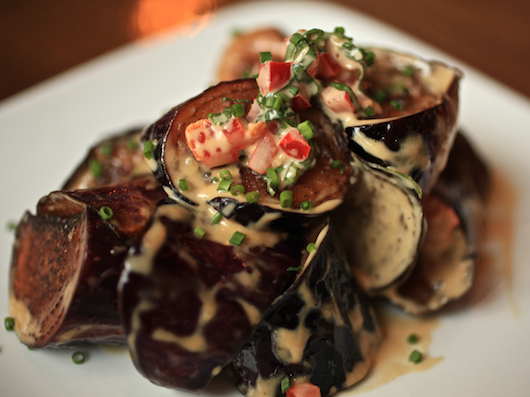 But the dish is really good and a nice combination of flavors. 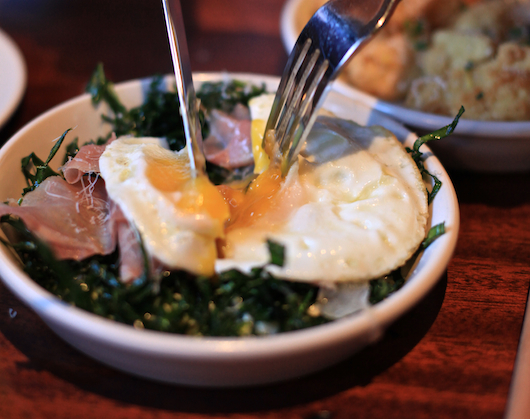 The collard greens with soft egg and ham, really good. There should have been more grits, but the dish was simple. Maybe a bit of acidity would help out, but that's getting picky. 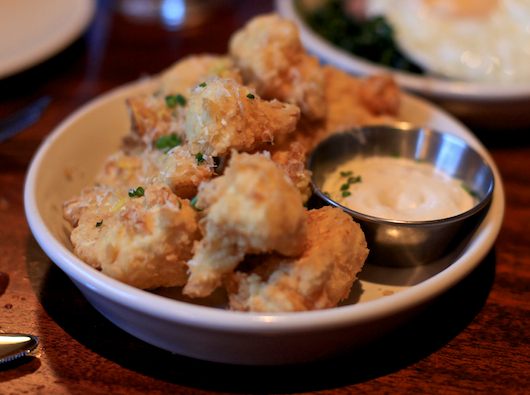 Fried cauliflower, cooked perfectly, the lemon aioli nice complement. For dessert we ordered the Deep Fried Fluffernutter. For those of you that don't know, a fluffernutter sandwich is marshmellow fluff and peanut butter between two slices of bread. BMLB adds banana to this sandwich and deep fries the whole thing. I didn't taste this, but judging by the reactions of my dinnermates, it was good. 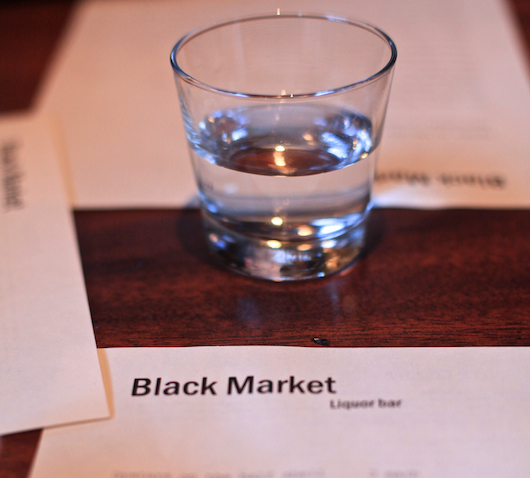 All the dishes were served on wood blocks with the Black Market name, smart move. The service could have been quicker considering how bust it was, but overall it was attentive. I do look forward to coming again and enjoying the nightlife. Congrats to Chef Antonia, great food. 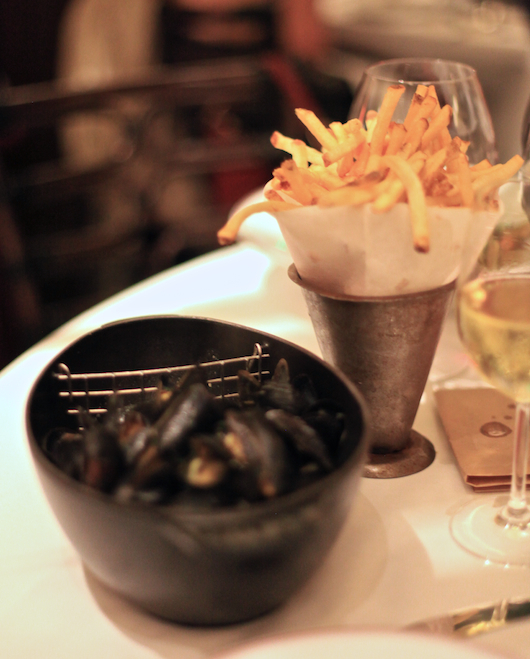 Celebrating Bastille Day at Bouchon, I like it! We walked up to the restaurant located on the second floor and we were seated immediately. I had been to the Bouchon in Las Vegas, the design and layout of the BH location is similar, but quite a bit smaller. 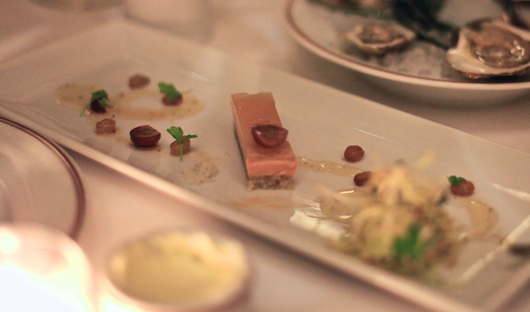 We ordered several starters escargot, foie gras terrine with sauterne gelee, heirloom tomato salad, goat cheese with frisee salad and oysters. 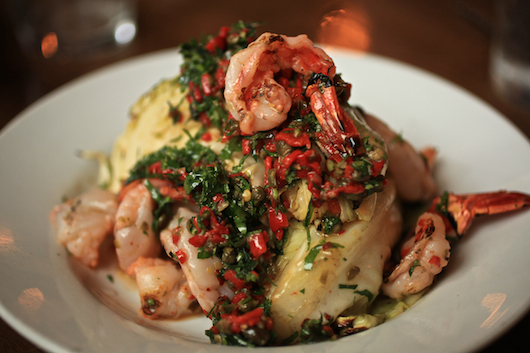 Each dish was simple, but had amazingly fresh ingredients. 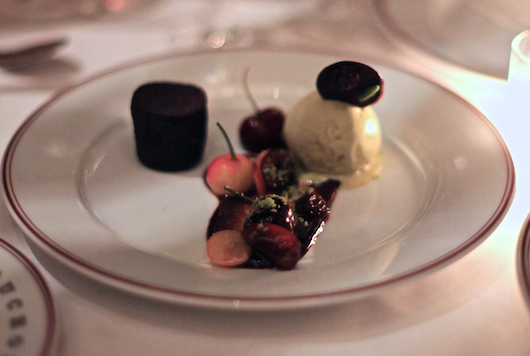 My only criticism would be that the sauterne gelee was too sweet for me. Our table did an amazing job of ordering a variety of dishes and it wasn't even planned. 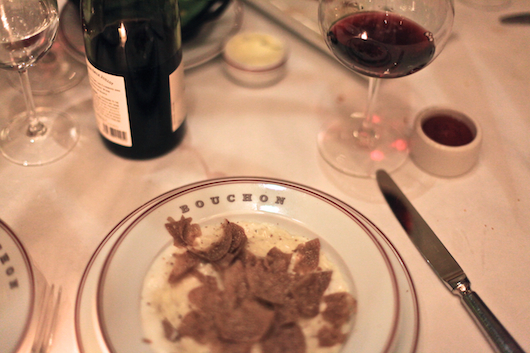 I had the a Bastille Day special Truffle Risotto, which was piled high with shaved white truffles over a rich risotto. It was a bit too thick, but the rice was not overcooked. Other dishes were the Moules au Safran, Gnocchi à la Parisienne, Truite aux Amandes, Steak Frites and Salmon served with vegetables. I sampled the dishes and everything was good. 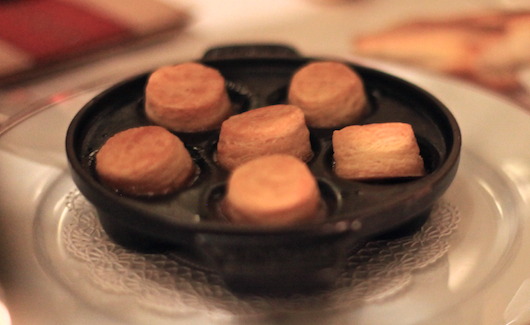 But because it's Bouchon, the expectations are high and so are the prices. The experience with friends is priceless, but similar to my experience at Bouchon Las Vegas, I was expecting the food to have a "wow" factor and it was just good. Enjoyed my dinner experience here, so I was excited for brunch. Brought a group of friends, all first timers. It was carmageddon weekend so I didn't think there would be a need for reservations. Took the Metro Red line and a short stint on the Gold line. There were several highlights in this list. 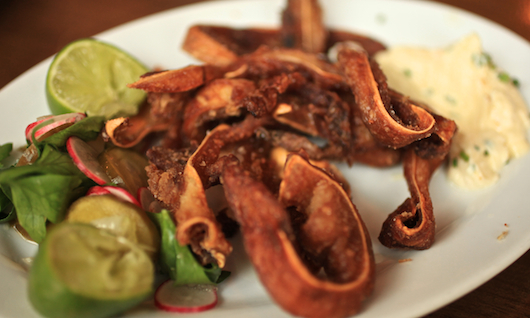 But the pig ear "chicharon" was my favorite. 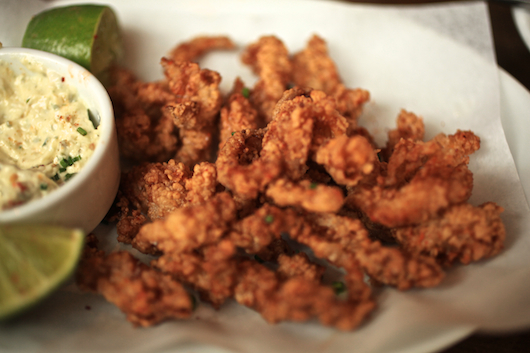 The crispy exterior and the slightly chewy interior, the horseradish and pickles add a nice acid and heat. 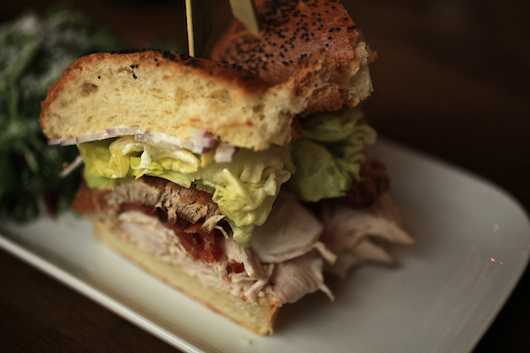 My entree was the turkey and pork belly sandwich. The sandwich itself was a bit dry and bland, more aioli would have helped. But the worst part about the sandwich was the fact that it arrived 10 mins after we had eaten all of the other dishes. 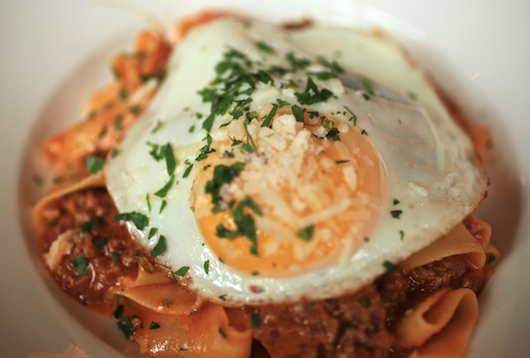 Overall brunch was delicious, besides a few execution issues. It was July 4th weekend and I expected lunch here to be crowded. It wasn't, got seated right away. A DJ was playing some good tunes and the menu looked interesting. One dish jumped out at me, it was a sandwich. The ingredients were as follows: cannellini beans, goat jack cheese, pickled jalapenos, arugula and a chipotle tomato sauce for dipping. All of these ingredients sound good together and very different from anything I've had before. I asked how the beans were prepared and they told me it was like a "patty". 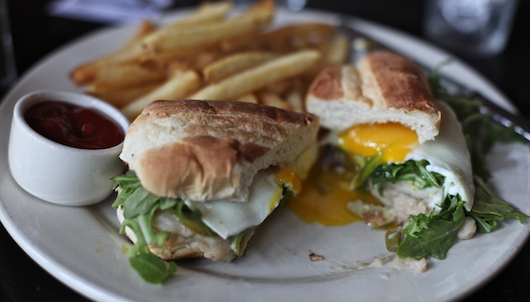 I decided to add a fried egg to this sandwich. When the sandwich arrived the first thing I noticed was the bread. It wasn't a crusty artisan style roll, but more like the hoagie rolls you can get at the market. I prefer a bit of a crust. 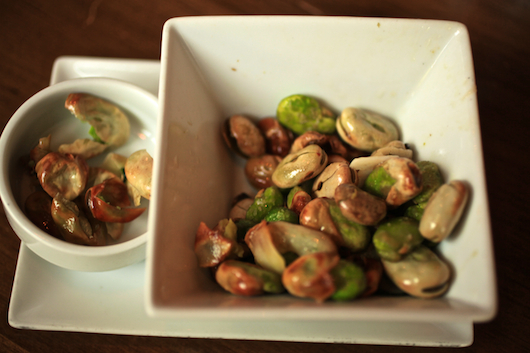 The cannellini beans were more like a spread than a patty. But the overall taste wasn't bad. I could have used more pickled jalapeno, but I liked the unique flavors and creativity behind it. The atmosphere is nice during the day with large windows and the service was attentive. The cocktails we had were also decent. 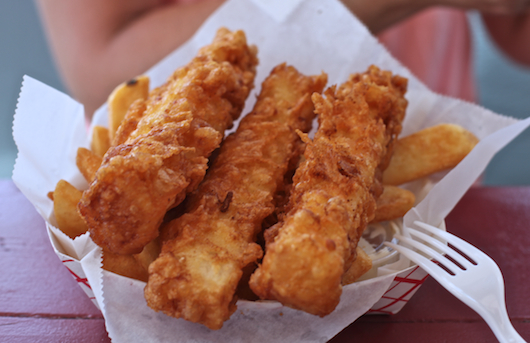 A beautiful summer afternoon and fresh seafood, these are the things that bring me to Malibu seafood. It had been awhile since my last visit, so I was excited. We arrived just after it opened and most of the tables were already taken. I made the mistake of ordering a healthy option, Grilled Albacore Tuna with salad and fries. My friend did the smart thing and ordered the fish and chips. We got lucky and nabbed a seat in the lower area. Our food didn't take long either. As I grabbed the tray, I looked at my food and my friends food. It was too late, I chosen the wrong path. 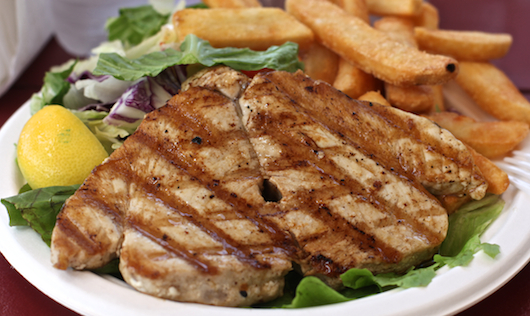 Oh well, I really do like grilled tuna and I did get fries, so I was hoping for the best. Unfortunately, I felt the fish was overcooked, especially for a place selling fresh fish. I expected it to be more rare. There was also no seasoning at all. But it definitely tasted healthy. I looked over at the table next to me and the fish sandwich looked delicious. My friend loved her fish and chips. Gotta stick with a smart game on my next visit. I love congee, but this version from Chef Harold Dieterle looks amazing. 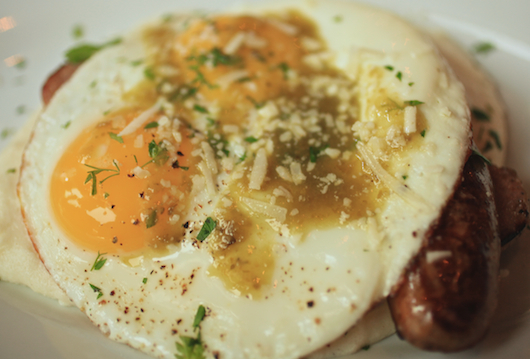 Harold Dieterle, "Sausage, Congee, Duck Egg" from Eater NY on Vimeo.